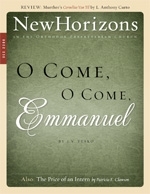 O Come, O Come, Emmanuel is one of the better-known hymns that is typically sung during the Christmas season. What some may not know is that it originated in the Middle Ages, around A.D. 800, as an antiphon, or anthem, that was restructured into verse form in the 1100s and was eventually published in Latin in 1710. The hymn was later discovered, translated, and published in 1851 by John Mason Neale, an Anglican minister. Great is the mystery of godliness (1 Tim. 3:16). The first Christians recognized this mystery as being of paramount significance. They were agreed on this truth. But what is "the mystery of godliness"? Having a summer or yearlong intern at your church is a costly proposition. But not to have one may be even more costly to the Orthodox Presbyterian Church. As baby boomer pastors retire, the need for young men to become undershepherds is increasing. How better to train them than under the oversight of a faithful pastor?